The capsule now won't fly until August at the earliest. 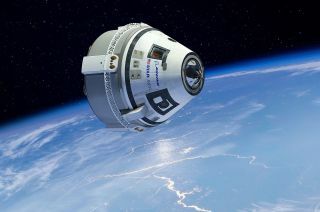 Artist’s illustration of Boeing's CST-100 Starliner in orbit. WASHINGTON — Boeing confirmed April 2 it will delay the uncrewed test flight of its commercial crew vehicle, citing a tight schedule and conflicts with another launch. In a statement to SpaceNews, Boeing said the first flight of its CST-100 Starliner spacecraft, called the Orbital Flight Test, is now scheduled for August on a United Launch Alliance Atlas V from Cape Canaveral, Florida. That launch had been scheduled for this spring. In the statement, Boeing said it had entered the "final phases of production" of the Starliner that will fly that uncrewed test flight. "Our Starliner team continues to press toward a launch readiness date later this spring," the company said, which also included the completion of a final set of testing milestones. Boeing, though, said the issue was a pad conflict with the Advanced Extremely High Frequency (AEHF) 5 military communications satellite, scheduled to launch in late June on another Atlas V from the same pad. Boeing said they had only a two-day launch window in May available for the Starliner launch before they would have to stand down for the AEHF-5 launch. "In order to avoid unnecessary schedule pressure, not interfere with a critical national security payload, and allow appropriate schedule margin to ensure the Boeing, United Launch Alliance and NASA teams are able to perform a successful first launch of Starliner, we made the most responsible decision available to us and will be ready for the next launch pad availability in August," the company said. That delay will, in turn, push back the second test flight of the vehicle, which had been scheduled for no earlier than August. Boeing said that, even with the delay in the uncrewed test, it expects to carry out that crewed test flight, which will carry two NASA astronauts and Boeing test pilot Chris Ferguson, "later this year." That's likely to be no earlier than November, according to industry sources. NASA last published the schedule of commercial crew test flights Feb. 6, despite statements last fall by the agency that it would update schedules "approximately monthly" as the test flights approached. Since that last update, SpaceX carried out its first commercial crew mission, the uncrewed Demo-1 test flight, launching March 2 and returning to Earth six days later. That most recent schedule called for a crewed flight test of SpaceX Crew Dragon vehicle, carrying two NASA astronauts, in July. That date is also expected to slip, although neither NASA nor SpaceX have provided an update on the schedule for that mission or the status of reviews of the Demo-1 test flight. Despite the delays, NASA Administrator Jim Bridenstine said April 2 he believed crewed test flights would take place this year. "We are in the midst of watching commercial crew continue to show advancements," he said in opening remarks at a House Science Committee hearing about the agency's fiscal year 2020 budget request. "By the end of this year, we will be launching American astronauts on American rockets from American soil to the International Space Station."